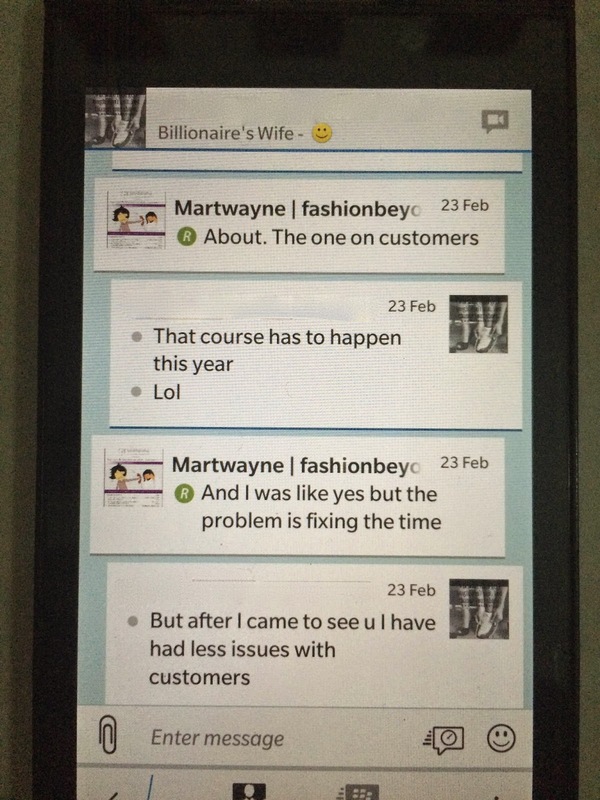 Martwayne | Power Through Fashion: "Dealing with HORROR Customers in Your Fashion Business" - Register for Volume 8 of our Fashion Entrepreneurship Course; Holds 22 March, 2015 on Your Blackberry Phone / App! 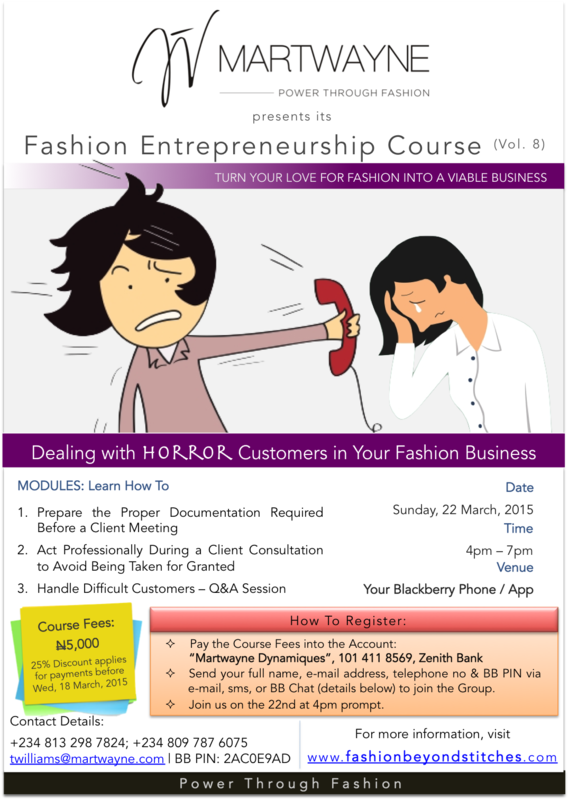 "Dealing with HORROR Customers in Your Fashion Business" - Register for Volume 8 of our Fashion Entrepreneurship Course; Holds 22 March, 2015 on Your Blackberry Phone / App! Yes we have all faced this many times. I have consistently heard so many horror stories from designers that it has become necessary to address these customer-related issues so designers can put up better structures which will protect them from situations like these in the future. I recall a private consultation with a previous FEC participant who had just about had enough with customers and her issues. 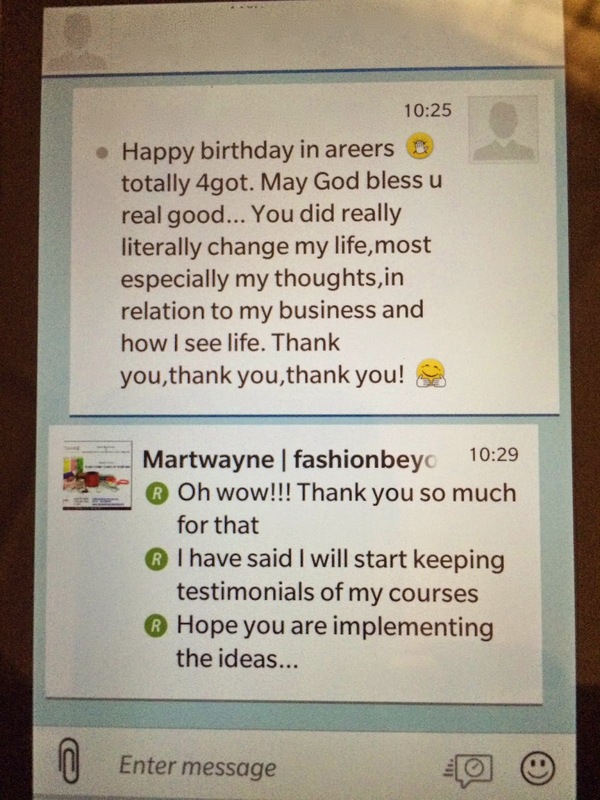 In fact she was the one who opened my eyes to the many challenges designers were facing with respect to this and pretty much told me I needed to run a Course on how to deal with customers. :-D Looks like we did something right. And on this note, here we are, formally launching Volume 8 of our Fashion Entrepreneurship Course. Yes yes.... we listened... and decided to act on it - thanks to someone who gave me this tip! Now location is not a problem at all! All you need is your Blackberry Phone or the Blackberry App installed on your phone and we are good to go! Theme: Dealing with HORROR Customers in Your Fashion Business"
[This is key because it sets the tone for the whole meeting + both parties are aware of the exact outcome of this and future meetings]. PLUS you get a 25% discount if you register before Wednesday, the 18th of March, 2015. It is always key to register ahead of time because it helps me prepare for the Course. The training handouts will be forwarded to you ahead of the training to enable you prepare your questions ahead of time. c) Join us on the 22nd at 4pm prompt! Great!!! I am so excited at this new opportunity to reach more people and provide more support structures for we designers - something that is really lacking in this environment. It just occurred to me that every small business is probably facing this, not only fashion businesses so the principles to be taught will pretty much apply to every business. So if you do have issues with customers generally, regardless of which industry you operate in, then you should join us as well. 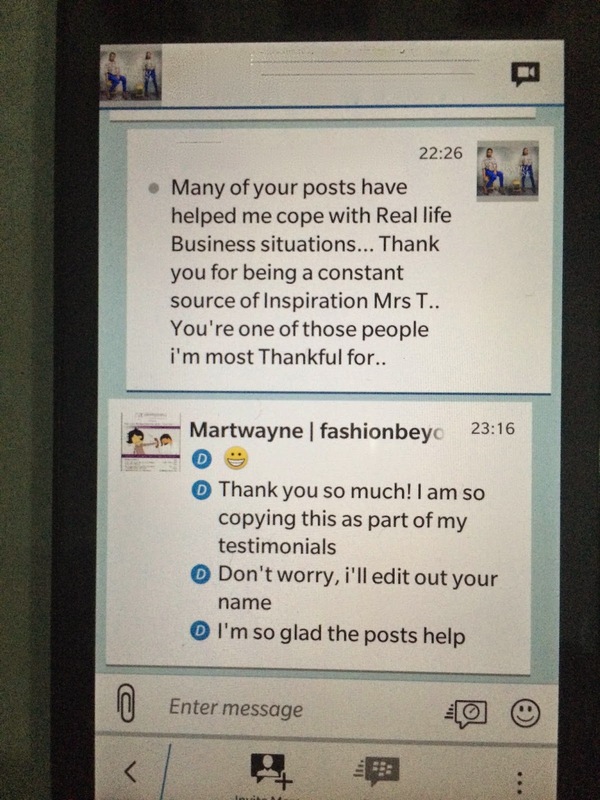 I really look forward to you all joining me on Blackberry from the comfort of your homes on the 22nd. Watch out for the post on our 2nd Course this March - Short Course in Design & Illustration - coming up shortly.